In response to questions from foreign friends about the popularization of foreign languages in Hainan, officials of relevant government departments pointed out that Hainan has gradually promoted English learning and training in various fields. 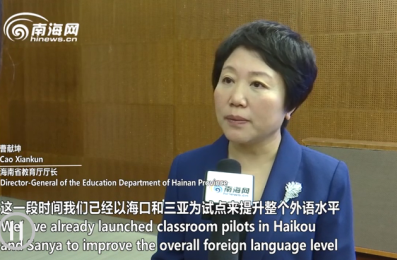 Cao Xiankun, the Drector of the Education Department of Hainan Province, told hinews.cn that Hainan has already launched classroom pilots in Haikou and Sanya from grade one to grade two to improve the overall foreign language level. “We also introduced some high-quality educational resources, including foreign teachers, we hope we can have some breakthroughs in teachers’ team building,” she said. According to Cao, Hainan has started to enhance the connection and cooperation with some domestic and international resources, for examples, the Affiliated High School of Beijing Foreign Studies University has been constructed already in Hainan, and the Affiliated High School of Shanghai International Studies University also started to be built in Sanya. “They’ll be helpful for us in terms of teaching and educational methods,” Cao commented. “Vocational training is also included our overall plan, we need to upgrade the foreign language level of vocational school students, and their abilities for using foreign languages must reach a certain level,” she said. “For the society, we’ll use the advantages of schools’ education and teaching, to enhance training for all the people,” she added. Han Yingwei, the Director of the Hainan Health Commission, pointed out that medical institutions have to create good foreign language environment and service environment, because they will be modified according to international standards. “We require the medical institutions at the cities and counties level should gradually set up the International Service Department, and create the international language environment, including signs,” he told hinews.cn.